This is a unique work which is the culmination of the author's many years of experience in the use of the Wechsler tests in clinical assessments and as a teacher of their use. In his research, he has questioned the validity of the hypotheses used to explain the meaning of Wechsler data and the heuristic value of Wechsler data in clinical assessment. This book traces the history and development of the tests and reflects on their psychometric qualities and clinical utility. A challenging work, it asks clinicians to examine some of their most cherished hypotheses regarding the use of these tests in clinical assessment. Of interest to clinicial psychologists, psychiatrists, and educators. (partial) Prologue. The psychometric development of the Wechsler scale. The clinical use of the Wechsler scales. 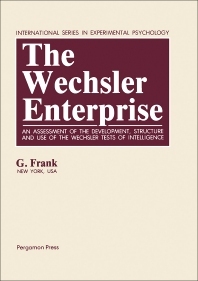 The use of the Wechsler in the assessment of intellectual difficulties. The use of the Wechsler in the assessment of cerebral pathology. The use of the Wechsler in the assessment of schizophrenia. The use of the Wechsler in the assessment of other psychiatric disorders. Factors which influence the clinical use of subtest patterning. The use of the Wechsler tests in scholastic assessment. Summary and conclusions. References.